Introduction: The 50 millesimal potency, is not fully utilized in our day to day practice. This retrospective study was done to reveal a new horizon for the physicians who use it occasionally and an eye opener for those who have never tried it. Aim: The aim was to evaluate the usefulness of 50 Millesimal potency of indicated medicine in the treatment of chronic diseases from a retrospective study. 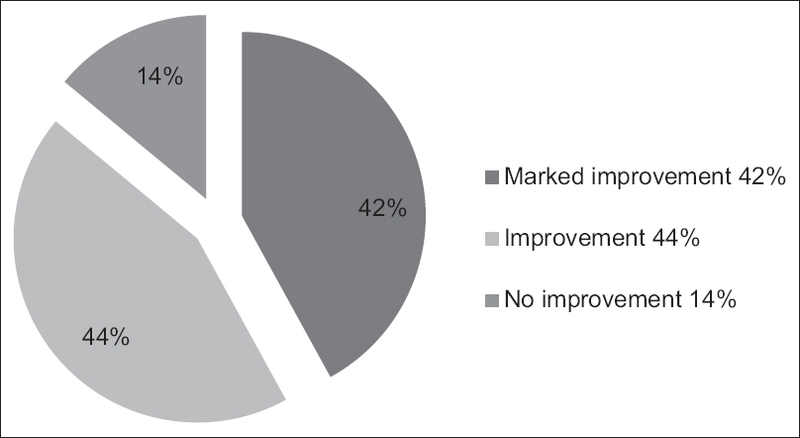 Materials and Methods: Cases treated with 50 Millesimal potency (LM) during January-May 2014, were screened and based on eligibility criteria, 50 cases were selected to study retrospectively. Treatment outcome was analyzed based on follow-up criteria. Data were statistically analyzed with Chi-square test in GNU PSPP Software. Results: 50 Millesimal potencies have the potential to give significant improvement (P = 0.01) in the treatment of chronic diseases. There were no cases reported with aggravation. The action of LM potency is not influenced (P = 0.97) by previously used Centesimal potency. Constitutional prescription has proved to have significant (P = 0.01) association with treatment outcome with LM potency, whereas Sector prescription (P = 0.12) does not. Irrespective of age, gender, and duration of illness, 50 Millesimal potencies act advantageously. Conclusion: The data suggest that 50 Millesimal potencies have significant beneficial effects in the treatment of chronic diseases. Though rated high by many stalwarts and Master himself, very few followed this method sincerely, some others rejected wholeheartedly and many looked at it with suspicion as it was published posthumously. From a detailed study on Dr. Hahnemann's handwritten manuscripts and experiments, it is found that, from the year 1837 to 1843, he has done 1836 prescriptions of 50 Millesimal potency. Master's conception about the superiority of the 50 Millesimal in comparison with the Centesimal potency was based on a significant number of experiments with the two scales. Based on these observations, we can be sure about the authenticity of the sixth edition of Organon of Medicine. For the cure of chronic diseases, Homoeopaths are utilizing LM potencies. Although this by no means indicates that the high-potency debate has come to an end, the gentle power of the small dosage convinces an increasing number of people. However, the kind of evidence required is still not available. Many cases found to obtain a desirable result with the help of 50 Millesimal potency, which made us to study retrospectively on the effect of this potency in the treatment of chronic diseases. This study was undertaken to reveal a new horizon for the physicians who uses it occasionally and an eye opener for those who has never tried it. To evaluate the effectiveness of 50 Millesimal potency of indicated medicine in the treatment of chronic diseases from a retrospective study. Cases recorded in Standardized Case Records (SCR) in which LM potency was prescribed, in the period of January 2014-May 2014, were selected from the outpatient medical record department of Father Muller Homoeopathic Medical College, Mangalore. Total number of 50 cases were selected (n = 50) according to eligibility criteria hence purposive sampling was used shown in [Table 1]. The homoeopathic medicines were selected as per the law of similia and prescribed singly at one occasion. Detailed case taking, its recording and interpretation of the symptoms was done in SCR. The symptoms were classified and evaluated to erect the totality. Help of repertorization was taken as and when required. Cases were either repertorized by conventional repertories (Kent's repertory, Boger Boenninghausen's characteristic repertory) or modern repertories (Synthesis, Murphy's homeopathic repertory). Constitutional prescriptions were based on the totality formed by analyzing and evaluating the mental generals, physical generals, characteristic particulars, and miasm. Sector prescriptions were based on location, sensation and pathology, modalities, concomitants, and causation. 50 Millesimal potencies were selected in all cases. Prescription in each case was based on individualization. Repetition and dosage varied in each case. No uniform diet schedule was maintained in all the cases. The dose of medicine was decided based on individual susceptibility. All the medicines used were prepared in strict accordance with Homoeopathic Pharmacopoeia of India. The follow-up criteria were further simplified into three categories and are as follows [Table 2]. The frequency of cases falling under each category was ascertained and subjected to statistical analysis. The analysis to determine the association between the follow-up categories with factors like age, gender, previous treatment, duration of illness, prescribing totality, system involved were performed by conducting Chi-square test in GNU PSPP Software (Version 0.7.9 for Windows 7). The software has been utilized to analyze the descriptive statistics through the option cross tabs. Here each variable was subjected to Chi-square test to find out whether there is statistically significant association with the treatment outcome. Among the 50 cases studied, Mean age is 39.27 (Standard Deviation 20.61, median 38). 42% are male and 58% are female among the group. The frequency of cases with respect to duration of illness and affected human body system is as shown in [Table 3] and [Table 4]. This variable of duration of illness is statistically analyzed for association with treatment outcome. As the number of dermatological and respiratory cases are comparatively more, few observations are drawn from the data and projected in [Table 5]. 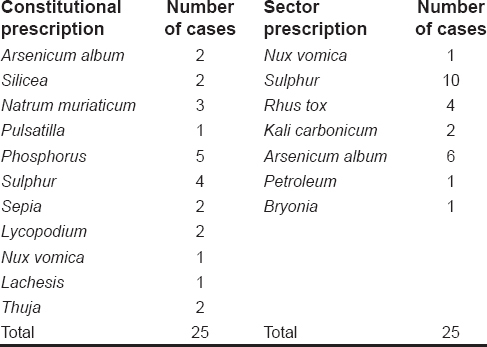 On analyzing the 50 cases, it was found that 35 cases were previously treated with other potencies [Table 6]. Hence, this variable was also statistically analyzed for association with treatment outcome. Basis of prescription and remedies used with their frequencies are enlisted in [Table 7]. 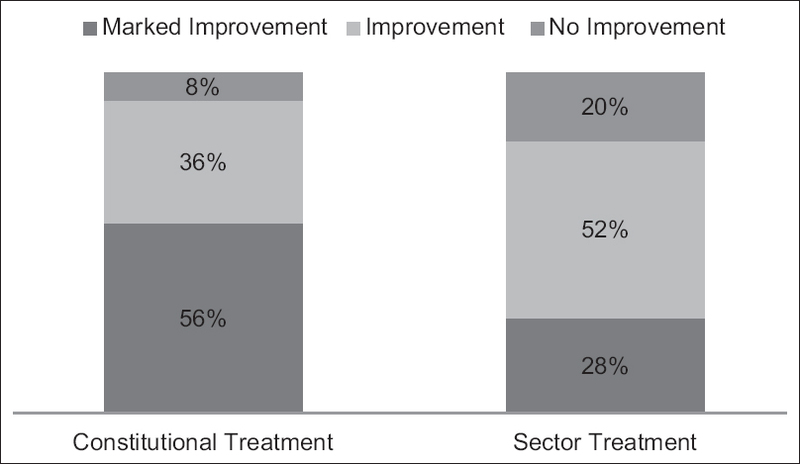 Contrast in response between sector and constitutional prescription is highlighted in [Figure 1]. It was observed that 25 cases out of 50 were treated with constitutional prescription and the rest with sector prescription. All the above mentioned variables were analysed whether it is significantly associated with the treatmant outcome [Table 8]. The potencies administered ranged from 0/1 to 0/6. The data acquired from the study [Figure 2]: Distribution of cases according to the treatment outcome] was subjected to Chi-square test using GNU PSPP Software for confirming the association between various variables [Table 8]. Repertorisation of remedies is essentially a process of elimination of all drugs other than the similimum. The tool has been used advantageously in all the cases. On analysis, it was found that 25 cases were treated with constitutional prescription and 25 based on sector prescription. As both are equal in number, this variable was also considered for better understanding of the action of LM potencies. 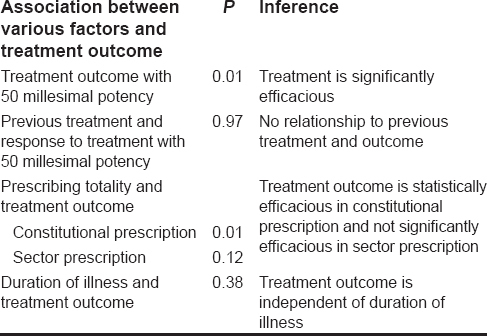 Treatment outcome is significantly efficacious in constitutional prescription (P = 0.01) and not significantly efficacious in sector prescription (P = 0.12). Though the potency range used in the study group was limited (0/1-0/6), advantageous effects are noticed. Hence, extensive usage of further potencies can be suggested. One of the positive outcomes of the study is that, there were no cases reported with aggravation, which is a valuable point to be discussed. During the preparation of 50 Millesimal potency, drug undergoes more succussions at each level than Centesimal potency. (Centesimal - 10, LM - 100). These vigorous agitations might have led to the formation of more nanoparticles and aggregates of drug molecules than those formed in centesimal. These remedy nanoparticles mimic as a low level stressor which signals the need for time dependent, sensitized compensatory adaptation mechanisms which are known as hormesis. This mechanism carries forward the organism toward health. Hence, the significant action of 50 Millesimal potency, without any aggravation, can be correlated to the key mechanism of formation of more nanoparticles and aggregates of drug molecules during their preparation. This study paves the way for further exploratory study on the hypothesis. Dr. Close  opines that selection of potency is influenced by susceptibility factor, which is in turn related to age, chronicity of complaints etc. Hence, centesimal potency is to be selected carefully according to these factors. The finding from this study reveals that the action of 50 Millesimal potency is independent of age and duration of illness. Further, it can be inferred that the action of nanoparticles and aggregates of the drug molecules in 50 Millesimal potency is independent of age, gender, duration of illness, and previous treatment with centesimal potency. As George Vithoulkas proposes, research in homoeopathy is the need of the hour. Each and every research effort adds validation to our field. And this descriptive study has been helpful in proposing new hypothesis for further studies on the usefulness of 50 Millesimal potencies. As the sample size is large (n = 50), the results obtained are more reliable. Potential limitations of the study can be improvised by further research in prospective multicentric design with longer follow-up on larger sample size. The usefulness of LM potencies can be assessed by analyzing cases with a limited age group of similar disease. Finally, the results from the retrospective study suggest that 50 Millesimal potencies have significant beneficial effects in the treatment of chronic diseases. The Authors are Grateful to the following people for their constant support and encouragement: Dr. Shivaprasad K., Principal, HOD, Department of Organon of Medicine, Dr. Roshan Pinto, Professor, Department of Organon of Medicine, Dr. Rita Chakraborty, HOD, Department of Repertory, Dr. Srinath Rao, HOD, Department of Materia Medica, Dr. Sunny Mathew, Medical Superintendent, Professor, Department of Materia Medica, Father Muller Homoeopathic Medical College, Mangalore. Hahnemann S. Organon of Medicine. Translated by William Boericke. Reprint. New Delhi: B. Jain Publishers (P) Ltd.; 2002. p. 294. Patel RP. My Experiments with 50 Millesimal Scale of Potency. 5 th ed. Reprint. Kottayam, Kerala: Hahnemann Homoeopathic Pharmacy publisher; 1986. p. 73. Adler UC, Adler MS. Hahnemann′s experiments with 50 millesimal potencies: A further review of his casebooks. Homoeopathy 2006;95:171-81. De Schepper L. LM potencies: One of the hidden treasures of the sixth edition of the Organon. Br Homoeopath J 1999;88:128-34. Paschero TP. Homoeopathy is a constitutional medicine. Asian Homoeopathic Journal 1992; July-Sept: 26. Jütte R. The LM potencies in homoeopathy: From their beginnings to the present day. Vol. 78. Stuttgart: Institute for the History of Medicine of the Robert Bosch Foundation; 2007. p. 78. Frei H, Everts R, Von Ammon K, Kaufmann F, Walther D, Hsu-Schmitz SF, et al. Homoeopathic treatment of children with attention deficit hyperactivity disorder: A randomized, double blind, placebo controlled crossover trial. Eur J Pediatr 2005;164:758-67. Bell IR, Lewis DA, Brooks AJ, Schwartz GE, Lewis SE, Walsh BT, et al. Improved clinical status in fibromyalgia patients treated with individualized homoeopathic remedies versus placebo. Rheumatology (Oxford) 2004;43:577-82. Patel RP. The Art of Case Taking and Practical Repertorization in Homoeopathy. 6 th ed. Kottayam, Kerala: Hahnemann Homoeopathic Pharmacy publisher; 1998. p. 67. Chikramane PS, Suresh AK, Bellare JR, Kane SG. Extreme homeopathic dilutions retain starting materials: A nanoparticulate perspective. Homoeopathy 2010;99:231-42. Bell IR, Koithan M, Brooks AJ. Testing the nanoparticle-allostatic cross-adaptation-sensitization model for homeopathic remedy effects. Homoeopathy 2013;102:66-81. Close S. The Genius of Homoeopathy. Reprint. New Delhi: B. Jain Publishers (P) Ltd.; 2006. p. 191-200.
http://www.vithoulkas.com/some-guidelines-concerning-research-in-homoeopathy. [Last accesed on 2014 Aug 13].